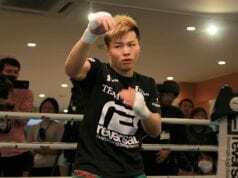 On the heels of the promotion’s biggest event, Tenshin Nasukawa may be on his way to ONE Championship. ONE Championship put on their biggest show to date last weekend, properly titled, ‘A New Era’. In many ways, it is a new era for the Asia-based promotion who debuted two of their highest profile free agent signings in company history in Eddie Alvarez & Demetrious Johnson. The night also saw Angela Lee take her first professional loss. Both Bibiano Fernandes and Shinya Aoki took home gold. Fernandes regained the bantamweight title from Kevin Belington amid controversy. There were plenty of celebrities in attendee as well. One in particular was RIZIN Fighting Federation’s Nasukawa, who sat cageside taking in the nights action. “Tenshin was in the audience in the first row, and he has definitely expressed his opinion – privately and publicly – that he would like to join ONE Championship”, Sityodtong said (transcript via onefc.com). Nasukawa currently lives in Singapore and trains at EVOLVE MMA. It seems like a perfect fit for both the fighter and promotion.